We are now operating new opening hours from 8.30am to 5.00pm Monday to Friday, and 8.00am to 12pm Saturday. At Unity Garage Ltd based in Barnsley we can repair and service almost any type of vehicle from small cars to large trucks. We are your one stop shop for all of your car and commercial vehicles needs. Our experienced engineers can carry out code reading and diagnostics on both cars and commercial vehicles and we have a large purpose built MOT test bay which enables us to test large campers (up-to 2800kg per axle), class 7 vehicles (3000-3500Kg), class 5 (mini-buses up-to 16 seats) as well as all petrol and diesel cars. 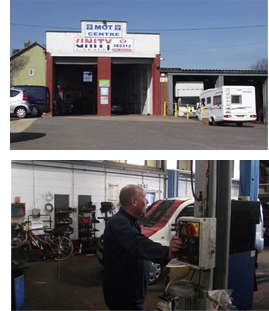 The team at Unity Garage have a wealth of knowledge and experience, in car repair and servicing and are totally dedicated to their work, we work to the highest of standards and up to date methods and equipment are always used. We pride ourselves on the fantastic reputation we have built in the local area of Barnsley and beyond for providing superb customer service and a garage service you can rely on at all times! Unity Garage is conveniently located on the A637 Barnsley to Huddersfield Road which makes us easily accessible as we are in close proximity to both Barnsley town centre and the M1. No matter what your vehicle requirements are we can meet your needs! Whether your vehicle needs accident and repair services, brake testing, headlight testing or a full MOT Test we can help! Our team of Diesel and fleet specialists GUARANTEE to provide an affordable first class garage service to all of our customers. Visit our services page to find out more or alternatively please feel free to contact us for a FREE No Obligation Quote on 01226 382312. If you prefer you can contact us online by completing one of our online contact forms, we are always happy to help you.